Julian is a sixth-year Ph.D candidate at researching formal political institutions (legislatures, political parties, and electoral systems) in electoral authoritarian regimes. His dissertation looks specifically at when, how, and why legislative institutions turn into active sites of political obstruction, elite contention, and loyalist policy-making under conditions of multiparty authoritarianism. 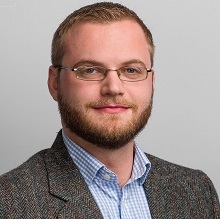 Julian was Visiting Researcher in the Department of Sociology at Ludwig-Maximilians-Universität München in Munich, Germany in spring 2018 and Visiting Scholar at the Center for East European and International Studies (ZOiS) in Berlin, Germany in Fall 2017. In 2016-2017, he was Visiting Researcher at the International Center for the Study of Institutions and Development at the Higher School of Economics in Moscow, Russian Federation. In 2015-2016, he was Doctoral Student Fellow at the Institute for European, Russia and Eurasian Studies at the Elliott School of International Affairs. Julian has been awarded the ASEEES Dissertation Research Grant, the 'Trajectories of Change' Fieldwork Grant from the ZEIT-Stiftung Ebelin und Gerd Bucerius, and the Hoffman Dissertation Fellowship in 2016 for dissertation fieldwork. He was also the recipient of a William and Helen Petrach Program on Ukraine Grant in 2014, as well as the David L. Boren NSEP Scholarship and the State Department's Critical Language Scholarship in 2012, studying at Herzen Russian State Pedagogical University and Akmulla Bashkir State Pedagogical University, respectively. He has conducted fieldwork in Ukraine and the Russian Federation. His work has been published in International Journal of Constitutional Law, Russland-Analysen, and Russian Analytical Digest. Political parties and parliaments in electoral authoritarianism, hybrid regimes, democratization, post-Soviet politics.